Artists are being asked to submit ideas for a £30,000 piece of public art at the University of Brighton. The university is partnering the Brighton Digital Festival and Brighton & Hove City Council to commission the work for the Huxley Building on the university’s Moulsecoomb campus in Brighton. The work will be displayed in the foyer at Huxley, home to the School of Pharmacy and Biomolecular Sciences, teaching pharmacy, chemistry, biology, biomedical science and ecology. Scientists there research causes and mechanisms of disease, new ways to treat them, better and more individualised ways to deliver these treatments, how people age, novel methods to remediate environmental damage, the effects of trace pollutants on aquatic life and to understand the lifestyle of mammals in an urban setting. The teaching spaces in the building are used to deliver degree programmes. The co-commission is open to professional artists with £2m public liability insurance. 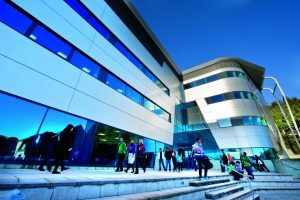 They should consider the university’s Mission Statement and strategic plan https://www.brighton.ac.uk/practical-wisdom/index.aspx, the function and identity of the building and the necessity of engaging a wider public, connecting the university with the local community. The university is committed to interdisciplinary engagement with complex contemporary challenges. The selection committee will welcome proposals that are consistent with the university’s commitment to interdisciplinary engagement with complex contemporary challenges. Proposals which include a digital element or where digital practice is a key component of the work’s development are welcomed. And proposals that explore how the arts, sciences and technology can combine to engage with complex challenges are also encouraged. Five shortlisted applicants will be notified on 15 June. They will receive a concept development fee of £1,000 to work on a detailed proposal for final selection. These proposals that can also be exhibited at the British Science Festival, being hosted by the universities of Brighton and Sussex in September. The winning applicant will be announced in the same month and will be expected to install the work within six months. The deadline for submission is 12 noon on 29 May, 2017. Email submissions to melissa@brightondigitalfestival.co.uk with ‘Huxley commission proposal’ in the subject line. The winner will oversee the creation and installation of all parts of the commission and liaise directly with the site manager; provide a detailed budget; ensure and demonstrate that the materials are fit for purpose; provide a maintenance plan; provide risks assessments and method statements for installation; be available for any press activity; collaborate with Brighton Digital Festival, University of Brighton and Brighton and Hove City Council and their representatives to promote the work; and promote and advocate for the new work through personal and professional networks. It is anticipated that the project would commence during the winter of 2017 with delivery by July 2018. This public art commission is being funded through Section 106 of the Town and Country Planning Act 1990. The £30,000 budget (inc VAT) includes the costs of any materials, artist’s fees, design development, artists’ insurance, supply and installation, signage, travel, and any other costs incurred in the production of the project/artwork. The artist(s) will be responsible for meeting all of these costs from the total budget allocated.